You have made the decision to incorporate your business. Now you should protect your personal assets from potential liabilities which may arise from your business. 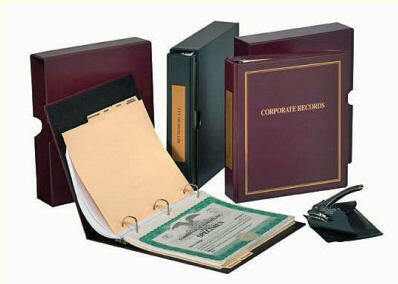 A Corporate kit will be your collection of documentation for your business being owned and operated as a corporation rather than as an individual. In this regard, it is important that the documentation be in place and fully executed. This documentation should include Organizational Minutes, Elections of Officers and Directors, Adoptions of Bylaws, Banking Resolutions, Corporate Bylaws, and a host of other organizational documents. You should be certain that all of these documents are signed and included in a central place. We are here to help you with this process. We charge $159.00 for an electronic version of the kit (PDF of all documents needed) or by special request we can special order a paper/binder kit for your. Either way, this price includes domestic shipping and handling.